Isokoski's lyric soprano is like liquid gold. What a treat it is to hear a soprano who is absolutely flawless in her scrupulous attention to the music (...) Conductor Mikko Franck and the Helsinki Philharmonic Orchestra offer sumptuous accompaniments, and what a pleasure to hear a recital in which the soprano does not sound as if she is producing more volume than is the orchestra. Mit einer beeindruckenden Atemtechnik, glanzvoll und unangestrengt wirkender Höhe und einem Legato, wie man es sonst nicht mehr oft zu hören bekommt, singt sich die Isokoski in unser Herz. Vor allem (Ave Maria aus Verdis 'Otello') fesselt durch Isokoskis beseelte Gestaltung und aufblühende Töne (...), die besser oder schöner gesungen schwer vorstellbar sind. (...) ein Pflichtkauf. Isokoski's gorgeous voice is backed up by a true musical and dramatic intelligence. (In Tatyana's Letter Scene) her tone projects a fragile vulnerability and she remains finely attuned to dynamic gradations throughout, lending more weight to the ever-growing emotional intensity in the climax. One of the finest vocal instruments of the moment, the exquisite soprano of Finland's Soile Isokoski roams amorously through the core repertoire in this outstanding anthology of solo arias. One of the most satisfying recitals of its kind. Voice-fanciers have long been lamenting that true legato is a dying art. With Isokoski around, it is not dead yet. Is there a more beautiful soprano voice in opera today? Listening to her rapt, long-breathed phrasing of Come, in quest'ora bruna, from Boccanegra, and Desdemona's Willow Song and Ave Maria, it's hard to think of one. One can only admire Isokoski's sincere and humble approach to art (...) Her silver-voiced soprano now shines in all its glory. A remarkable achievement, underpinned with consistently excellent musicianship. (...) One listens with renewed attention, surprised by the wealth of possibilities (Soile Isokoski) discovers. 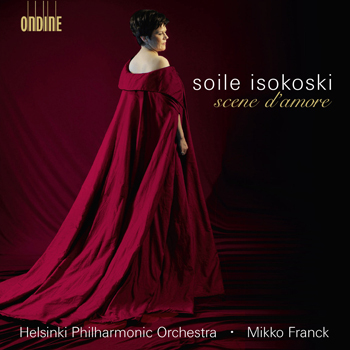 This disc features the great lyric soprano Soile Isokoski with popular love scenes and arias from 19th-century Italian, French and Russian operas marking her greatest successes on stage. Included are the famous aria "Sì. Mi chiamano Mimì" from Puccini's La Bohème, with which Soile Isokoski gave her opera début in 1989, as well as Marguerite's aria "Il était un Roi de Thulé" and 'Jewel Song' from Gounod's Faust and the famous 'Letter scene' from Tchaikovsky's Eugene Onegin, which she sung at the Finnish National Opera, in 2006, to international acclaim. Audiences and critics hail the Finnish soprano as one of the finest singers in the world. Soile Isokoski's recent orchestral albums on Ondine (Sibelius's Luonnotar and orchestral songs, ODE 1080-5; Mozart Arias, ODE 1043-2; R. Strauss's Four Last Songs and other orchestral songs, ODE 982-2) have been praised as top-choice recordings and earned the highest distinctions such as the BBC Music Magazine Disc of the Year 2007 Award, a 2007 MIDEM Classical Award, and a 2002 Gramophone Award. Soile Isokoski is accompanied on this disc by the Helsinki Philharmonic Orchestra under the direction of young star conductor Mikko Franck.